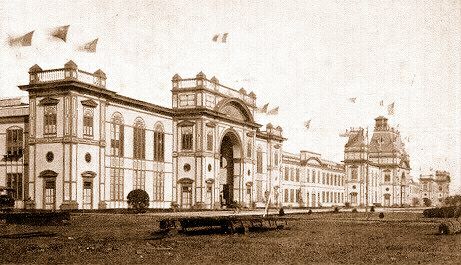 On the south side of El Prado, between the Plaza de Panama and the Montezuma Gardens, was situated the Panama-California Exposition's Indian Arts Building. Designed in a style reminiscent of the California Missions, the building featured plain walls, deeply-set arched windows, and several belfries. 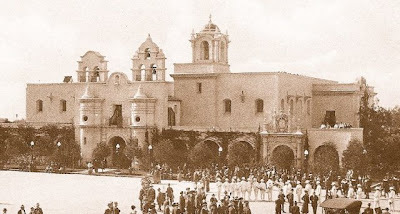 The building's main entrance, facing east upon the Plaza de Panama, was based on the design of the Sanctuario de Guadalupe, in Guadalajara, Mexico. A wood-railed balcony, placed above a deeply-arched portal, was flanked by medallion-decorated panels, and topped by a decorative niche. Small towers were located on either side of the entrance, surmounted by two large belfries of simplistic design. An arcade surrounded the building on two sides, and its interior was softly illuminated at night by indirect lighting. The north entrance, facing El Prado, was designed in a heavy Baroque style, contrasting with the east entrance, and featured decorative columns, scrollwork, arabesques, and ornate finials. Adjacent to the north entrance, over an archway in the arcade, was a Carmelite belfry containing two bells. 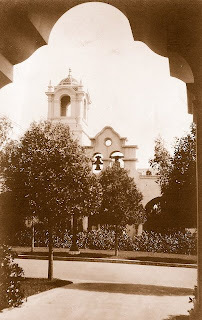 Beyond this belfry, on the west side of the building, stood a domed tower overlooking the Montezuma Gardens. The tower was based on the design of a similar tower found in the city of Puebla, Mexico; set on a square base, with tall arches, corner columns, decorative finials, and a blue and yellow tiled-dome. 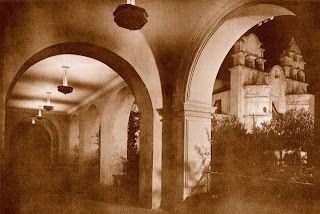 The south facade of the building, overlooking Palm Canyon, contained a large arched window set in an overhanging balcony, supported by decorative brackets. The exhibits within the building consisted of numerous arts and crafts created by Native Americans of the southwest. Hand woven rugs, decorative baskets, clay bowls and vessels, paintings, and hand-crafted jewelry were among the many items displayed.